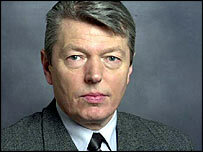 Stopping pupils from "cyber bullying" their teachers will be at the "top of his agenda", says the Education Secretary Alan Johnson. Teachers have complained angrily about websites which allow pupils to make anonymous criticisms of school staff. Addressing the Association of Teachers and Lecturers, Mr Johnson also defended the new vocational diploma system. And he announced an expansion of a £40m per year drive to raise standards in London schools. Speaking at the ATL's annual conference in Bournemouth, Mr Johnson promised to support the union's call to prevent malicious attacks on individual teachers through websites and e-mails. "It must be something that's at the top of my agenda over the coming year," he told delegates. "I'd have voted for the proposition myself," he said, responding to the union's call for the government to "protect the integrity" of teachers from such online insults. "It's quite right for teachers to highlight their concerns," he said. But Mr Johnson declined to say whether he would be approaching website publishers or taking specific measures to prevent such internet bullying of staff. In a warmly-received speech, Mr Johnson spoke of the importance of education in pursuing social justice. This included narrowing the gap in educational achievement between children in deprived and prosperous areas, he told the conference. As such, he announced a three-year extension of the London Challenge initiative, which Mr Johnson said had raised standards in inner-city areas that had been "written off as educational disaster zones". The approach is also to be applied to two more urban areas, but Mr Johnson said these had not been selected yet. 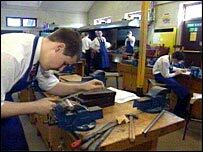 With unskilled jobs set to reduce rapidly, Mr Johnson stressed the importance of the vocational diploma qualifications - which he claimed would create future entrepreneurs, such as Sir Richard Branson and Sir Alan Sugar. Last month, Mr Johnson had said that the diploma scheme "could go horribly wrong" - a comment which he now said had been the "cardinal sin of giving a straight question an honest answer". He said it had been a recognition of how difficult it would be to get the diploma system in place within the planned timetable, in an initiative involving employers, schools and universities. But he said he was confident that the plans were watertight - because a faulty start for this vocational education scheme "would destroy the whole initiative". He told teachers that diplomas would provide skills for the "knowledge economy" and would be an important part of pupils staying in education and training until the age of 18. Mr Johnson also defended the government's academy programme, saying that academies were raising results in deprived areas which for many years had been served by unsuccessful schools. And he rejected suggestions that school league tables should be withdrawn.